Synopsis- Seventeen-year-old Abike Johnson is the favourite child of her wealthy father. She lives in a sprawling mansion in Lagos, protected by armed guards and ferried everywhere in a huge black jeep. A world away from Abike’s mansion, in the city’s slums, lives an eighteen-year-old hawker struggling to make sense of the world. His family lost everything after his father’s death and now he sells ice cream at the side of the road to support his mother and sister. When Abike buys ice cream from the hawker one afternoon, they strike up a tentative and unlikely romance. But as they grow closer, revelations from the past threaten their relationship and both Abike and the hawker must decide where their loyalties lie. 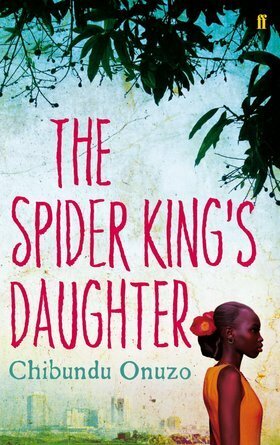 Set in Lagos, Africa, The Spider King’s Daughter is a story told from alternating viewpoints of 17 year old rich girl, Anike and eighteen year old nameless street hawker (sells ice-cream). Anike is out scouting for a new friend to amuse herself with and comes across the handsome hawker on the street. She comes up with a plan to have her car break down so that she can talk to him and is surprised by his educated speech and the way he holds himself. They form an unusual friendship that has many layers of complexities and through the two points of view we see that despite their connection they seem to keep most of themselves hidden and don’t really get to understand each other as I’d have liked. Anike is selfish, manipulative and arrogant and yet there are glimpses of her throughout the story of an Anike that I liked. Her father is a powerful man and she has learnt some valuable skills in surviving in his household. The hawker was quite likeable, protective of his family and determined to attain financial security legitimately. When he realises that Abike’s father is linked to his death he begins to question their friendship and takes matters into his own hands. There are some really interesting characters in The Spider King’s Daughter and I felt they were quite well developed. In the beginning I did find it distracting that the author repeated some scenes to show it from another view point as it became repetitive but this happened less as the story went on. I enjoyed the simplistic writing style of the author who very was able to capture the characters conflicts without too much information. However, I did feel like things were left a bit unresolved at the end and I was a little disappointed by this- even though my wishing for a happily ever after probably was a little unrealistic. Two contrasting characters on their own journeys amidst a backdrop of Africa makes for an engaging literary read. About the author: Chibundu Onuzo was born in Nigeria in 1991 and is the youngest of four children. She is currently studying History at Kings College, London. When not writing, Chibundu can be found playing the piano or singing. The title captured my attention, and then I loved the cover and the synopsis. I just might give this one a try.